“Give yourself a past with a painless tattoo. Tattoos have been the subject of so many sordid jokes, but some patterns can be quite beautiful in their own right. - funny old fashioned fantasies in faded blue on pink skin, smacking of seedy Eastern ports and rugged pasts." "Anthropologists term this technique of letting your T-shirt do the talking, the "new primitivism" and draw parallels between body painting in Polynesian cultures and T-shirt wearing in the First World." I often talked to Caroline Baker, the Fashion Editor when I was delivering my drawings to NOVA Art department. She loved the idea of the Tattoos. Honey magazine had already published a small piece of reportage in 1969. Photographer James Wedge was in the Nova office with his portfolio the same week and showed some interest in the Tattoos for the shop he owned with his girlfriend - COUNTDOWN in Kings Road. It was unexpected, but the feedback from the tiny Honey article and the demand at Countdown, was enormous. So Nova decided to run a feature with James Wedge as photographer and with his gorgeous girlfriend Pat Booth as the model. It was published in the April 1970 edition. By then, Vogue had called us and had rushed through a feature to be published at the same time as Nova. Soon, we were approached by Bloomingdales, New York to open a “Painless Tattoo Parlour” with our T-shirts and translucent Body stockings. We began to import real quality T-shirts from the USA for printing and dyeing. We were a ‘cottage industry’ - our bath was always full of sodden garments soaking in dye and our workshop print-tables were always full of Tattoos and Breasts prints. Both Molly and I worked on the Eagle and Snake Tattoo drawings, first we made pencil drawings and then traced them onto film using black ink for the final separations. The Mother Tattoo was drawn from a wood engraving I had made at Art school - Molly drew the Peacock Tattoo in the same way. 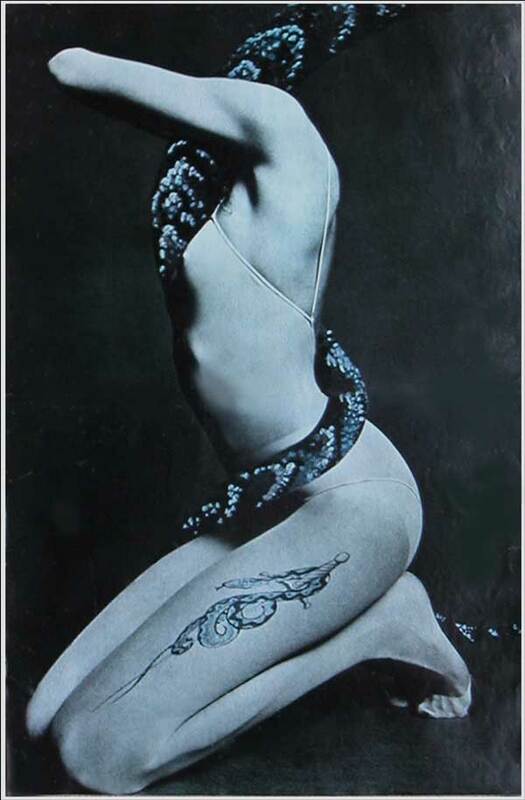 The Snake and Dagger image was made especially to stretch down the thigh. 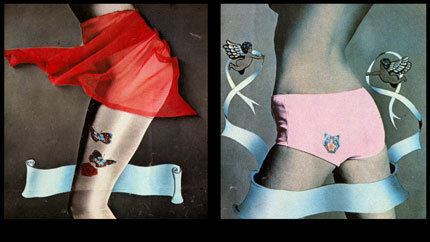 Smaller Tattoos were made to print on the backside of flesh pink cotton knickers and for the T-shirt arms. 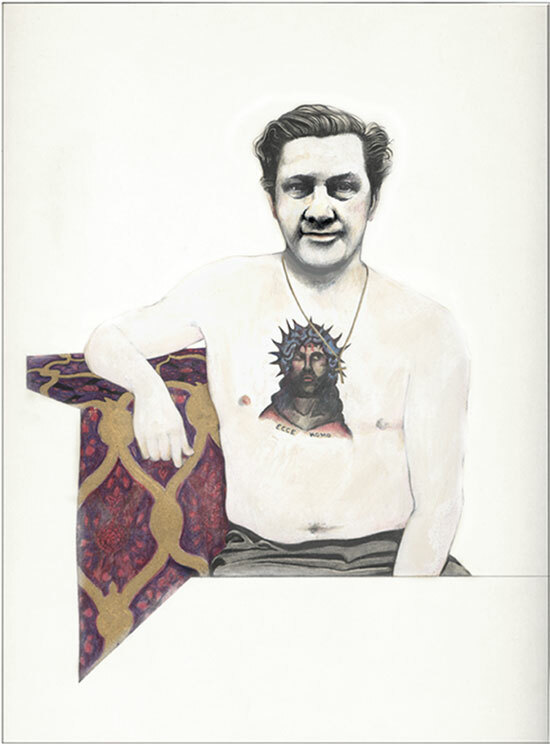 Through 1968 ‘69 and ‘70, the Tattoo prints generated interest worldwide and continued to sell but we had so many other ideas at full tilt, we never really exploited the possibilities. Printed Tattoos on clothing soon became acceptable mainstream fashion ....by then we had moved on to Paradise Garage with an entirely new look - experimenting with prints on Black. Black was always taboo - apart from Black Leather, there were no Black clothes anywhere and so this formed the basis of our next collection of Rock’n’Roll clothing. In ‘71 Sylvain Silvain hung out at Paradise Garage and returned with the Dolls in ‘72 after Malcolm had taken over the shop. 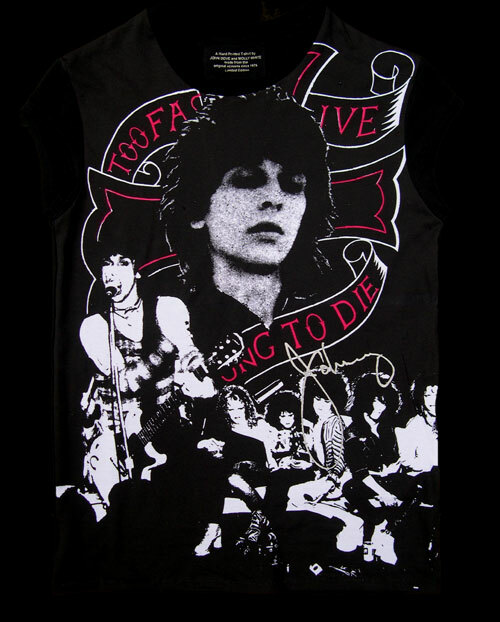 At the height of UK Punk, we designed a collection of T-shirts - “20th Century Rebels” which included a tribute to Johnny Thunders. Thunders was the hottest Rock’n’Roll guitarist throughout the 70’s and the main inspiration for Steve Jones. After the Dolls disbanded Thunders continued as a solo Artist and just went on playing his heart out till he died in 1991. We made a print of Johnny’s portrait in front of a blow-up of his tattoo “Too Fast To Live - Too Young To Die” - the Dolls montaged into the background. In the 80’s Johnny visited our studio in NW10 - he was curious about our setup. He applauded our passion with Rock’n’Roll T-shirts and it was cool to be included in our Rebel Collection. We made him a Black on Black Snakeskin suit for his UK tour. 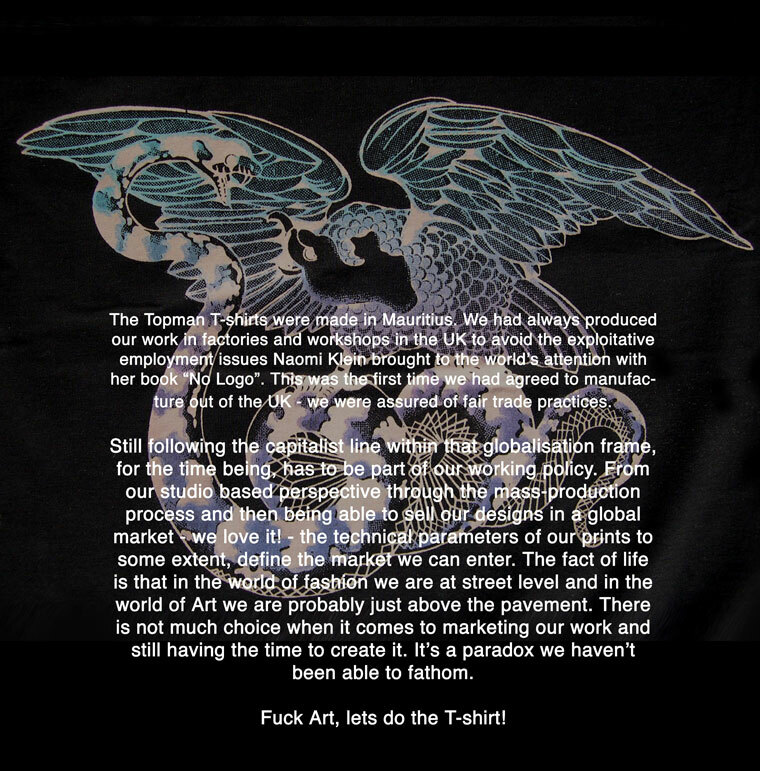 In the 80’s we made drawings of the Too Fast To Live motif in positive and negative form as a continuous print. 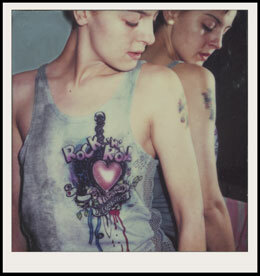 In ‘76, when we opened at KITSCH-22 - 22 Woodstock Street W1, we overprinted the Tattoos on another revived T-shirt print, the Breasts T-shirt. This print never left the print-table for long. With ‘BOY Blackmail’ we continued to produce it through to the mid eighties. 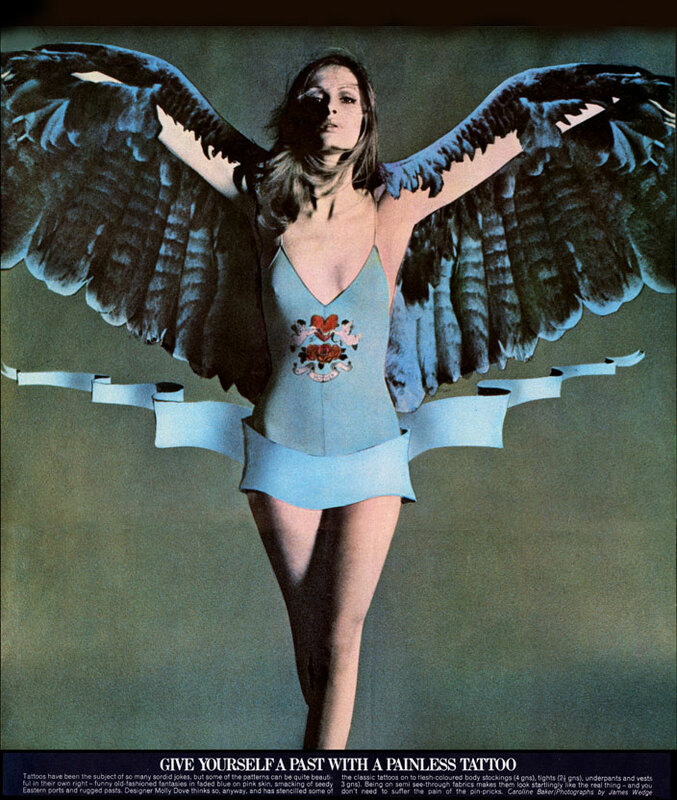 The photo was one of a series of pictures Derek Hutchins made for the BOY blackmail catalogue. Later in the 80’s our prints became mainstream. They gradually morphed into becoming ‘fashion products’. This picture of the Dagger print in ID Magazine reminded us that images which appeared diluted for us still had some potency when mixed by the ID stylist into a unique eclectic ensemble. At the end of the eighties, there was a further Tattoo idea I just had to make as a T-shirt - a celebration of Lou Reed’s classic LP “Rock’n’Roll Hearts”. That line "deep down inside I've got a Rock'n'Roll heart" was just pure poetry - our cultural romanticism. 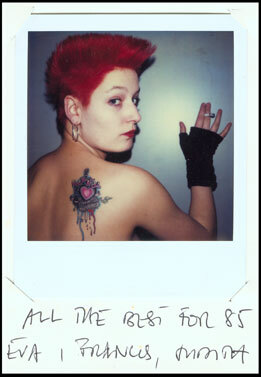 This Polaroid of the beautiful Wendy May is a great memory of those Rock’n’Roll days. 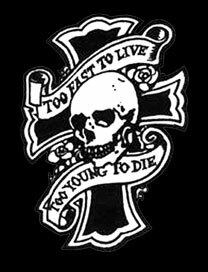 Wendy’s own tattoo is “Too Fast To Live, Too Young To Die” - she’s so real. 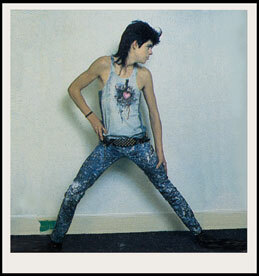 Artist, Dan Perfect, wears the Rock&Roll Hearts Tee with Modzart Blue Moonjeans. Alice Hiller wrote in ‘The Observer’ “John Dove and Molly White have been designing and hand-printing T-shirts since the late Sixties when they were among the first people to start exporting them to America. Originators of the Seventies glitter T-shirt and the Punk black-on-dayglo Tiger stripe designs, they now produce 1000 T-shirts a week. This years best sellers show a torn picture of the Mona lisa, captioned ‘Anarchy Is Art Isn’t’ and a ‘Rock’n’Roll Heart’ tattoo (pictured above)”. A Polaroid from friends at “Olmo” in Berne, Switzerland with a complementary touch. At this time, the Japanese became aware of our designs and by the mid-eighties half of our T-shirt production was going out to Japan. 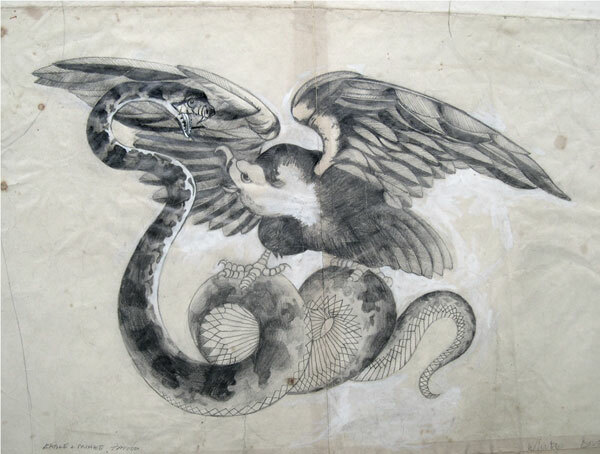 To celebrate our connections with Japan, Molly and I made updated drawings of the Eagle and Snake Tattoo design and produced silk T-shirts in an oriental style. Tattoos in Tokyo of course, had a very different kind of history to the UK - a world away from Anglo-American street fashion and remained within that traditional Japanese underworld culture. This little incident took me by surprise and woke me up to the taboos that surround Tattoo Art. 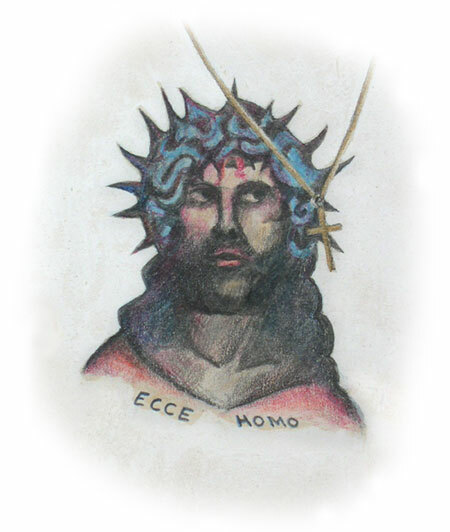 It gave me a brief insight into its subversive power - we started to draw Tattoos. Suddenly, there seemed to be a lot more tattoos - we talked to anyone we met with tattoos and checked out those famously tattooed characters around Soho at the Golden Lion Pub in Dean Street, the French House and the Coach and Horses. Classical Tattoo subjects of wild animals - Eagles, Snakes, Panthers, Leopards etc., looked great on the body. I’d had ideas for making tattoo images from neon signs, pin-ups, cars and refrigerators but these were abandoned for the more traditional images to give more authenticity to the illusion of a tattoo on the body. Molly had utilised nineteenth century acid dye processes with her silk printing and she used Gelatin and Bicromate for the transfer of images to the screens. Now we thought we should research the new chemistry coming through with the first screen print supply company in London - Sericol, in Parsons Green. They specialised in inks for the commercial art industry - everything for paper, nothing for fabric. 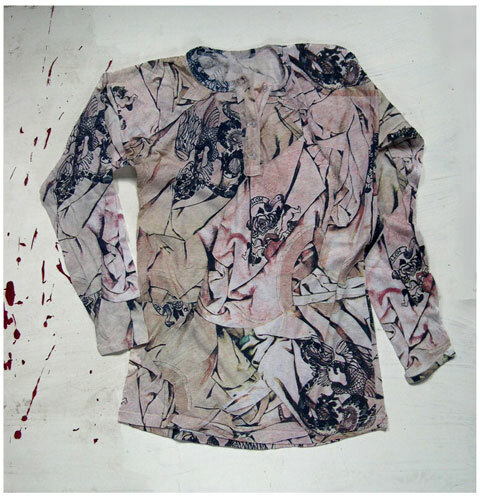 On the other hand, their new photographic emulsions were simple to use and we soon had the designs developed, up and ready to print on translucent skin-tight body stockings and T-shirts that we had dyed flesh coloured. We had found a company in Northern Ireland, Polyprint, who had imported pigment textile dye stuffs from the US. They were just the greatest - they intermixed with practically anything and were really fast and tough after a good baking always remaining soft to the touch. We have some T-shirts printed in the 60’s that have literally been worn to bits but they still retain the freshness of the printed image. We printed the tattoos on government surplus cotton and silk jersey T-shirts that had been made by Morley for the British Army in the 50s. 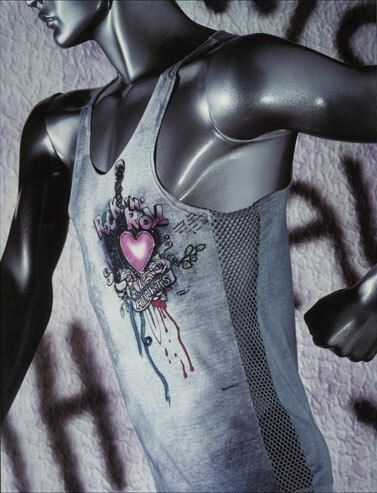 The other vests we used were from Invicta, a standard underwear company. 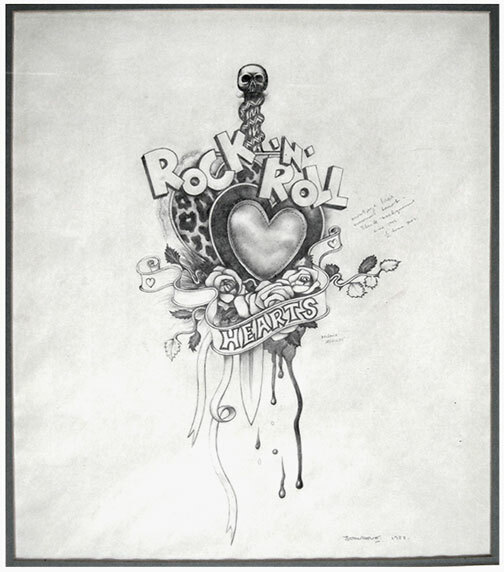 The Rock’n’Roll Hearts drawing was the first in a series of prints where the drawing dominated the print. Our usual concept of making prints was to allow the flow of the process to take over. Using half-tone separation to enhance the delicacy of the line, we followed through with the print of a continuous undulation of crushed Tattoo T-shirts. 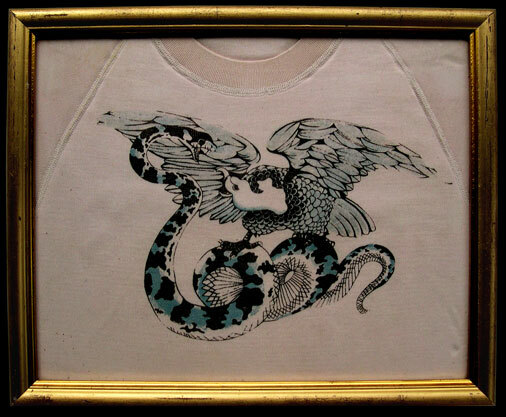 In June 2008, Paul Gorman of THE LOOK PRESENTS commissioned the Snake and Eagle Tattoo T-shirt to be reproduced for Topman under the WONDER WORKSHOP label - a slightly enlarged image printed on a biscuit tan colour especially for men in place of the original flesh pink. The negative version on black didn’t get made but we’ll use this idea later!